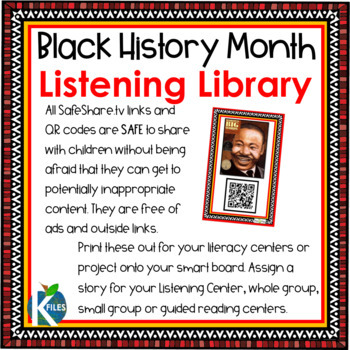 A Black History Month Listening Center with SafeShare.tv links and QR Codes. 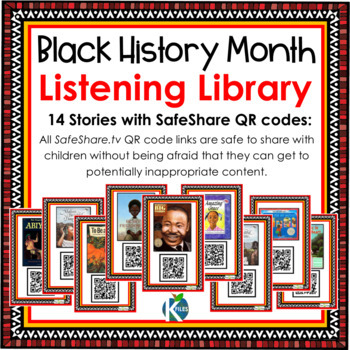 All SafeShare.tv QR code links are safe to share with children without being afraid that they can get to potentially inappropriate content. Each read a loud link has been filtered through SafeShare.tv and are now free of ads and outside links. If you do not have access to a QR Code Reader, I have also provided a hyperlink to each story. You can simply click on the book cover and it will bring you right to the story. Print these out for a bulletin board display ( your students can even scan the code from your smart board), download the file onto your iPads, or you can simply project the story onto your smart board. 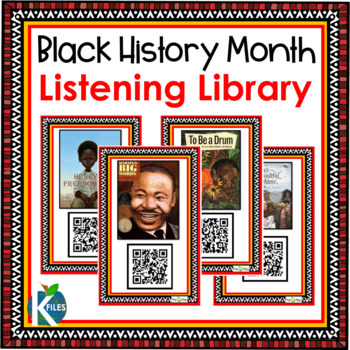 Assign a story for your Listening Center, whole group, small group or guided reading centers. After reading, provide the children with a simple story map, sequencing map or related activity to complete after listening to enhance and assess comprehension. *At times, links may become broken, I always revise/edit the codes one month prior to the season. Please let me know in the Q/A tab if a link needs to be "repaired". If you would like to be notified when more themed listening libraries become available follow my store at the top of this page! 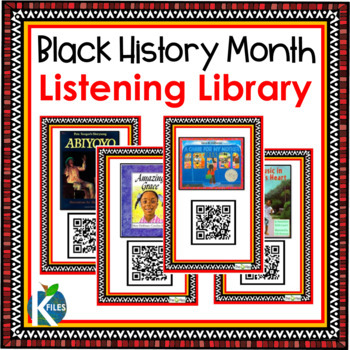 Please visit The K Files blog for additional resources and ideas for the primary classroom!